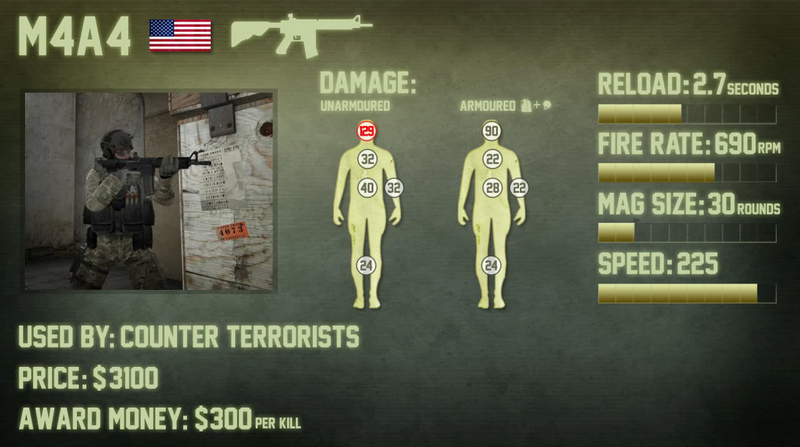 The M4A4 is the default weapon of choice for Counter-Terrorists in CS:GO, only to be surpassed by its Terrorist counterpart, the AK-47, due to it’s lack of one-shot-kill ability against opponents with helmets (only 90 damage). Still, you should aim to master both, since you will use them in most of your games. As a bonus the M4A4 lets you move the fastest among the rifles. On CT side it is recommended to buy the M4A4 as the standard weapon after the light rounds, when you are not playing AWP.The M4A4 is very effective on all distances, but especially for medium and long distance. Spraying can be effective with the M4A4 in short distance fights against multiple opponents, due to its high rate of fire. Even if you don’t hit a headshot (for which you should always aim) the first hit will most likely throw off your opponents aim.